Seattle Times food writer Bethany Jean Clement taste-tests the lunches from MealPal, tallies up the savings, and talks to both the company and restaurateurs about how the business model can possibly pencil out. In newly expensive Seattle, it’s a deal that seems too good to be true: a to-go lunch from any of about 150 restaurants for only $6. Anyone regularly hungry at noontime around here knows that it’s easy to spend twice that much. But the six-buck Seattle lunch is real with the subscription service MealPal: Buy 12 lunches for $6.39 each or 20 for $5.99 each, download the app and you’re in business. Conditions and caveats: MealPal is up and running in 17 cities worldwide, but it’s relatively new in Seattle and currently includes restaurants in or near South Lake Union and downtown only. (As you might expect, it’s big with the Amazon crowd — MealPal says Amazon employees have reserved more than 200,000 lunches since the service launched here last spring.) Each restaurant makes just one MealPal-specific dish available per day. Some choices are still available morning-of, but the full slate of options is on the app the evening before, making the midday meal a premeditated affair. 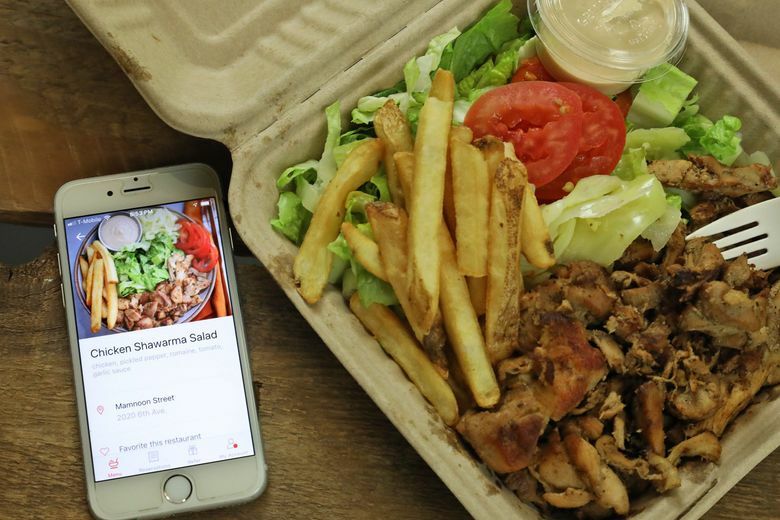 Finally, unlike the multitude of delivery services, you have to depart your workspace and go fetch your lunch — though once you’re at the restaurant, you just use the app to scan a QR code and skip to the front of the line. MealPal meals also expire after 30 days. My second MealPal outing was almost as good, and an even better value: the chicken Parm with Caesar salad from downtown lunchtime favorite Zaccagni’s. East Coaster owner Darlene Boline knows old-school Italian, and her generous Caesar is an unfancy yet compelling one: With crisp lettuce just-right-overdressed with tangy dressing plus bigger-and-better-than-boxed croutons, it achieved excellence in the side-salad category. The chicken Parm had the flavor of a quality bird, a lovely deep-brown breading, not too much cheese and lots of salty-bright marinara, in a portion so big you might need a nap at your desk afterward. Zaccagni’s regular menu features a chicken Parm sandwich, with no salad, for $9; I’d value the MealPal combo at $10-plus. Exploring the SLU options, I also got MealPal from the mobbed-at-lunchtime Mamnoon Street, a tasty chicken shawarma salad with a lemony tahini dressing; it’s regularly priced at $10. Maslow’s by FareStart made me a very nice jerk chicken sandwich; a comparable one on their regular menu rings in at $13. From Homegrown, a green goddess chicken bowl featured enough ideally ripe avocado and herby, rich, possibly-mayo-based dressing to make a salad for lunch totally tenable; a similar non-MealPal bowl (albeit with grains) costs $11.45. Wassef Haroun, owner of Mamnoon Street, says he was “very skeptical” about partnering with MealPal, citing concerns “about ‘deal’ approaches to promotion that end up creating races to the bottom, ultimately to the detriment of the hardest working in our industry.” But, he says, it’s easy to plan for the right volume of lunches, and he was impressed with the smooth experience of the app for the customer. Not all restaurateurs want aboard. Josh Henderson, who runs Seattle’s Kiki Ramen, shared an email he got from the company last year, pitching “Benefits for Kiki Ramen: new customers in your door, free marketing, incremental revenue, and increased efficiency (when you have a line winding out of the door).” He felt that the marketing element was the strongest selling point, but he declined MealPal’s overtures because the numbers just didn’t work for him. “We get plenty of those losing-money marketing opportunities every day,” he says. “We don’t need another one.” The nearby restaurant Marination also just didn’t see the positives outweighing the negatives, co-owner Roz Edison says, in terms of offering high-quality food at a good value while continuing to care for the experience of the regular walk-in customer. Talking about MealPal with participating places in Seattle, I heard a couple of things that may be indicative of how the business model works. Two restaurants told me that MealPal has already renegotiated their initial agreement, reducing the per-meal payment to the restaurant or the number of meals that the restaurant can sell per day via MealPal. MealPal’s Biggins says they can’t share details on their per-meal pricing agreements, but that they have “introductory rates sometimes.” And while the restaurants aren’t supposed to share the details of their MealPal deals, either, the owner of one spot told me that their initial payment from MealPal was $8.50 for every meal, now renegotiated to $7.75 — for the same meals for which the company is receiving only $6 from customers. 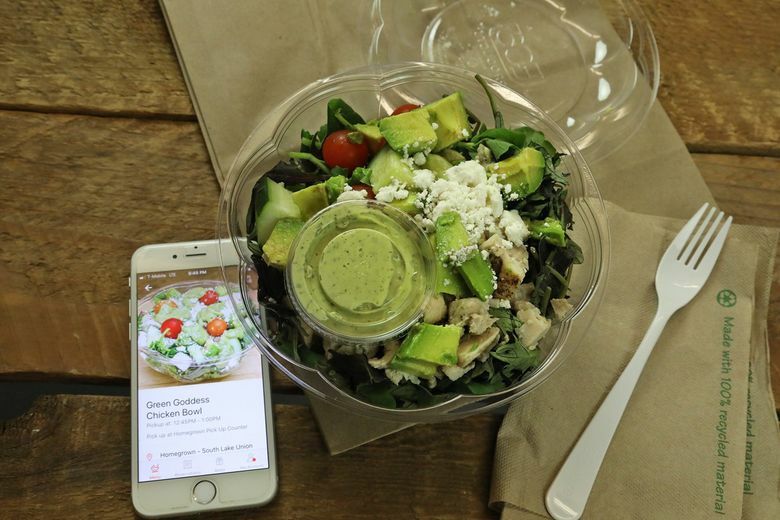 Biggins calls the arrangements “collaborative,” pointing out that Seattle is a new market for the company, and saying that in New York, where MealPal launched in 2016, the company is profitable. MealPal has also raised more than $35 million in venture-capital funding since its 2016 founding. Mamnoon Street’s Haroun — himself from a tech background of a decade-plus at Microsoft — says his guess is that MealPal seeks “to build a big user base as quickly as possible, then to exert more pricing pressure when they get more guest leverage” — that is, lower the rates the restaurants receive. Then, to try to keep the restaurants happy, MealPal might “offer up-sells and better marketing tools. The premise is to become ‘essential’ business partners” — that is, restaurants come to rely on their MealPal income. It looks a bit like the now-common Uber business model: Start out subsidizing costs with venture-capital funding, then after achieving market share and becoming part of patrons’ day-to-day, begin making adjustments to customer or vendor pricing. “And there are other ways for MealPal to monetize customers,” Haroun notes. The company is gathering data on a valuable young, tech-savvy, urban demographic all over the world. New MealPal members are asked at sign-up where they work, and more than 90 percent answer, according to Biggins, who says this lets them see what co-workers are ordering for lunch and possibly have a friend pick up theirs.